← Will Areva survive a cascade of crises? In the past a few months Argentina has catapulted to the front end of global attention on new nuclear builds with deals for three new nuclear reactors, two from China and one from Russia. Additionally, the country has its own nuclear R&D program which supports the development of a 25 MB SMR based on PWR designs. The combined value of the Chinese and Russian deals is estimated to be between $18-20 billion. Of this amount, most of it will be financed by China’s CNNC (deal worth $13 billion) and Russia’s Rosatom (deal worth $6 billion). Even with these favorable terms, Argentina may still have to go to international financial markets for its share and this will be an issue given the country’s less than stellar track record in paying its debts. CNNC would be paying much higher labor rates for construction than at home, the supply chain would stretch halfway around the globe, and CNNC would have to import a lot of their own people to support the project competing for them against demands at home for the same engineering talent. Rosatom might face similar challenges. For starters, World Nuclear News (WNN) reports that China has two reactors on its order books to be delivered to Argentina. The first is an 800 MW PHWR Candu type reactor with work to begin on it in 2016. The second is the first export of CNNC’s new 1100 MW Hualong One to a South American country. China will provide most of the financing of both reactors, but the credit line come with a price. Unlike many export deals from other suppliers, which have strong localization programs to benefit the domestic industries where the reactor is being built, CNNC is demanding in return for favorable financial terms that Chinese companies be given priority for all aspects of the project including design, construction, and the fuel cycle. These terms have not set well with Argentina’s nuclear regulatory agency nor the government both of which have doubts about being a first of a kind test case for an export deal for the Hualong One. CNNC has only recently broken ground for two Hualong One units at a domestic site so experience building one isn’t available. Construction of CNNC’s GEN III ACP1000 reactor has begun at the Fuqing nuclear power plant in Fujian province. The ACP1000 design will be used for Units 5 and 6 at the plant as demonstration models that are expected to be the cornerstone of China’s nuclear export ambitions. The ACP1000 is CNNC’s version of the Hualong One. CGN nuclear also has a version of the Hualong One and has broken ground in China for units 3 & 4 at the Fangchenggang site in the Guangxi province. As a result, Argentina has postponed closing the deal for its Hualong unit until 2017 which should give CNNC time to prove that it can keep to schedule and costs for the domestic project. Argentina will also likely keep an eye on CGN’s progress. CNNC has tried to sweeten the deal with Argentina by offering to transfer some of the Hualong One PWR technology as part of the arrangement for using Chinese suppliers. The PHWR would be built at the Atucha site near Buenos Aries. The CNNC Hualong One is expected to be built along the Paraguary River, but the exact location hasn’t been set. In April Argentina signed an agreement with Rosatom for construction of a 1200 MW VVER. Both Roastom and the Argentine government said the final terms and conditions for the project will be completed later this year. Initial reports indicate that like the Chinese project, Rosatom would provide financing of between 50-70% and offer some technology transfer in return for Rosatom providing the reactor, turbine, and fuel cycle. Localization of components has rarely been a significant element of Rosatom’s export deals and this latest one is no exception. The site of the Rosatom unit was not disclosed in news media coverage of the agreement. CAREM (Spanish: Central Argentina de Elementos Modulares) is an Argentine nuclear reactor designed by CNEA (National Atomic Energy Commission). A 25 MWe, pressurized water reactor version of CAREM (profile right) is currently being built near Atucha I Nuclear Power Plant as the first prototype, and a second one of 100-200 MWe is planned to be installed in Formosa Province. The first prototype is planned to receive its first fuel load in 2017. The date for deployment of the second larger unit would be set thereafter. CAREM is being positioned to be used to supply energy for areas with small populations/small electricity demands. Another possible use is to power seawater desalination plants to supply water and energy to coastal sites. Like other SMRs, the plan is to build multiple units at the same location to scale up generation of electricity to follow economic development. There are plans for 100 MW and 300 MW designs. CNEA has its eye on export markets for the various SMR designs. Argentina has three nuclear reactors generating about 10% of its electricity. Its first commercial nuclear power reactor began operating in 1974. According to WNN, the profile of installed units includes three PWHR Candu type reactors the oldest of which was built in 1974 (Atucha 1). Atucha 2, a 700 MW PHWR, entered revenue service in 2014, and a third unit Embalse, a 600 MW Candu 6, was completed in 1983. The majority of the country’s electrical power generation comes from a combination of natural gas and coal (68%) and hydro (28%). According the US Energy Information Administration, natural gas, which is used widely in the electricity, industrial, and residential sectors, represented 53% of total primary energy consumption in 2013 (3.22 quadrillion Btu). Oil is the primary fuel used in the transportation sector and represented 33% of total primary energy consumption. Argentina produces almost all of its domestic fuels for the transportation sector. Despite the commitments to new nuclear plants, Argentina is continuing to exploit its coal deposits with construction of a 240 MW mine mouth power plant near one of the major mining sites. Can Argentina afford major new energy infrastructure? What’s powering the Chinese and Russia deals with that the export arms of both governments are offering to finance 50-70% of the deal with their respective domestic firms providing almost all of the components. The Economist in its 2014 profile of the country points out that Argentina’s finances are “perilous” composed of inflation, little budgetary space for economic stimulus, and a history of corruption with government projects. 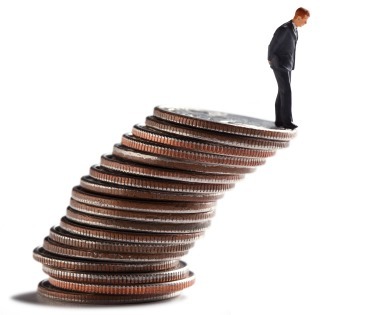 The magazine reports the economy is stagnant, the peso is falling in unofficial markets, and inflation is rising. A default on bonds with a group of US hedge fund investors in July 2014 put a crimp on its ability to get international loans in hard currencies. It was the country’s second default with international investors. Since then, the Economist notes, the government has “fudged” the data on how the economy is performing making it difficult for outside observers to make informed judgments about new investments. Current reserves of hard currencies have been falling from $50 billion in 2011 to less than $30 billion in late 2014. The Economist reports that the current regime of Cristina Fernández de Kirchner has little political incentive to settle accounts and this sets up a situation in which international lending markets are now playing a waiting game for a new regime that will play by the rules. The next elections are in October of this year. How Argentina will finance its end of the massive nuclear projects remains to be seen. The Chinese deal is worth $13 billion and 30% of it will require Argentina to come up with a minimum of $4 billion of the costs. The Russian deal, with a similar funding profile, will be worth about $6 billion which means Argentina’s share would come in at about $2 billion. Taken together, Argentina will want to go to international financial markets with a bond issue worth at least $6 billion, but with a junk bond credit rating. If the deals result in the Chinese and Russian only financing 50% of the costs, the borrowing burden for Argentina would be closer to $10 billion. 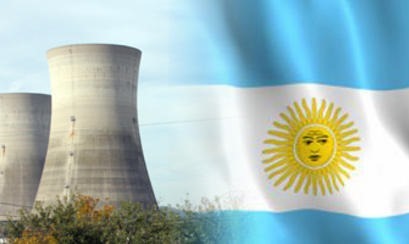 It is one thing to sign off on nuclear energy projects with favorable financing from the vendor, but, eventually, Argentina’s nuclear future depends on its government cleaning up its act with international lending institutions. This entry was posted in Nuclear and tagged Argentina. Bookmark the permalink. Take reporting from ‘The Economist’ with a large grain of salt. It is far from an objective source. Although, as is typical in the world of Economics, being wrong all the time appears to have no effect on credibility. 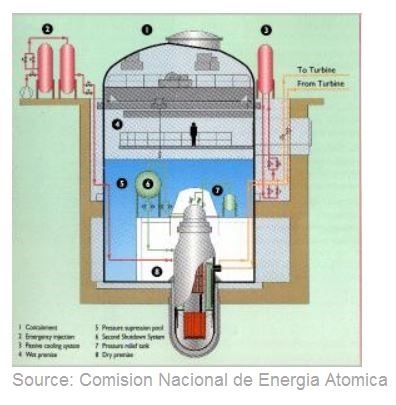 The reactor is effectively a trojan horse in bankrupt states like Argentina.